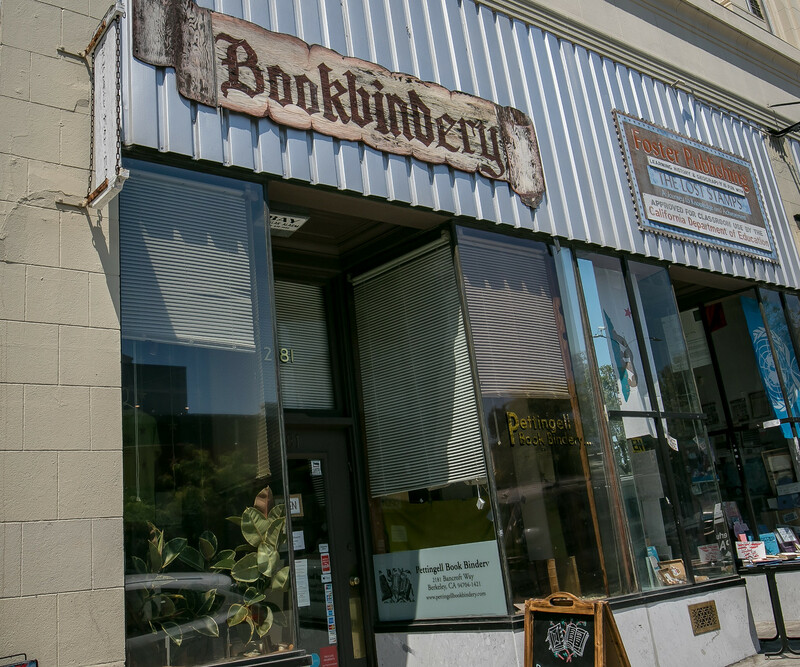 My post on Lasher’s Electronics was a well-received mission creep – looking at an older business in Berkeley which in and of itself may not be intrinsically quirky. Luis Pettingell. 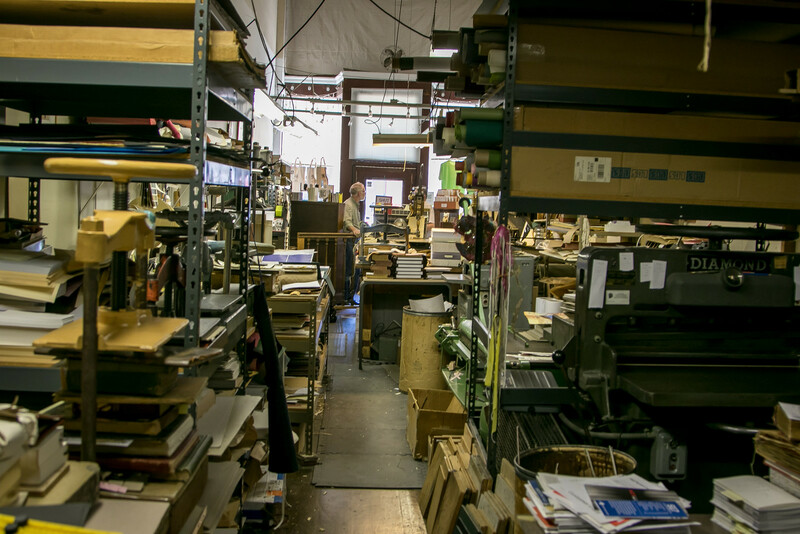 Photo courtesy Pettingill Bookbindery. 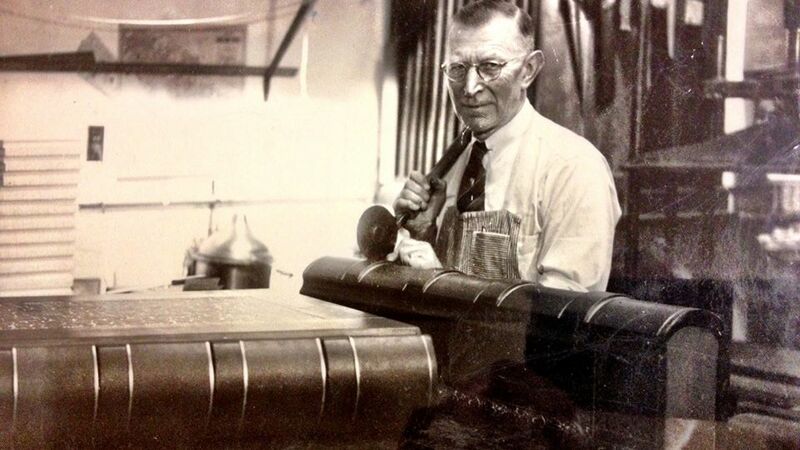 Luis Pettingell founded Pettingell Book Bindery in 1926. It was first located on University Avenue, later relocated to Center Street, and again to its current location at 2181 Bancroft Way. 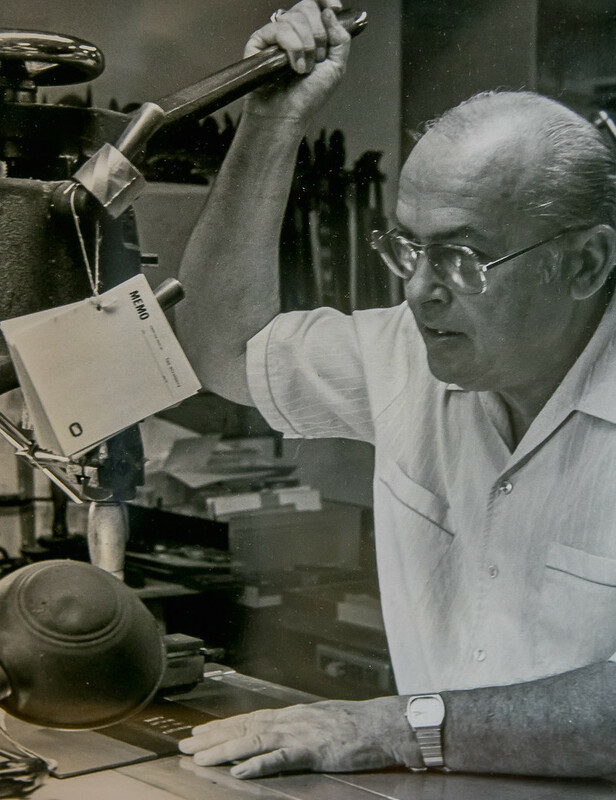 Theodore Hirshberg. 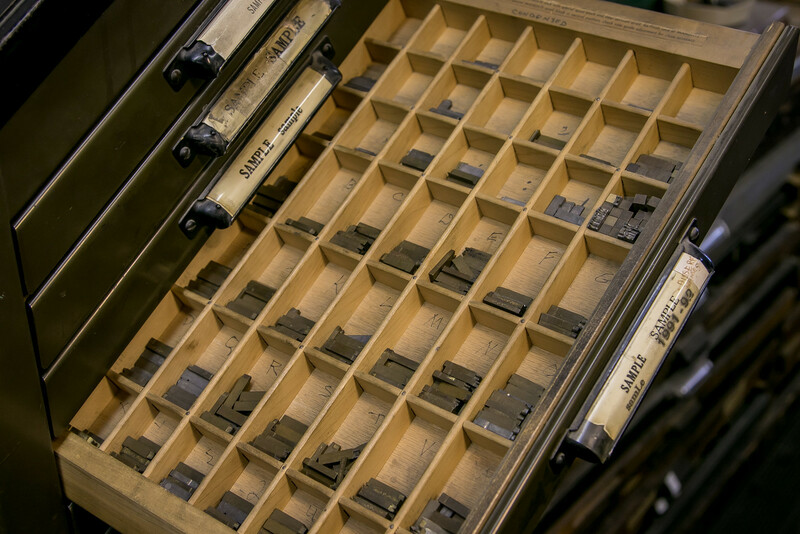 Photo courtesy Pettingill Bookbindery. Coy Johnson bought it from Luis Pettingell; Johnson’s wife in turn sold it to Theodore and Shirley Hirshberg, who came from Ohio to California in 1952. Theodore and Shirley ran it until 1994 when it was sold to Klaus Rötzscher, who owns it today. Rötzscher was born in Leipzig in 1955. 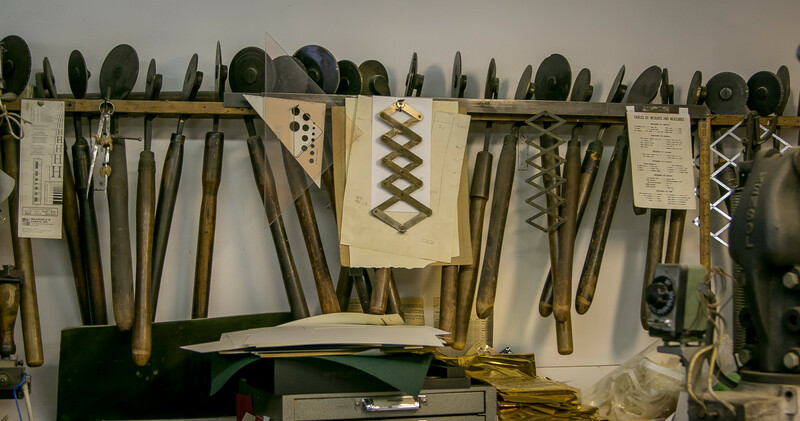 He entered an apprenticeship in 1972 with Schürer Bookbindery in Leipzig and stayed on after his graduation as a journeyman. 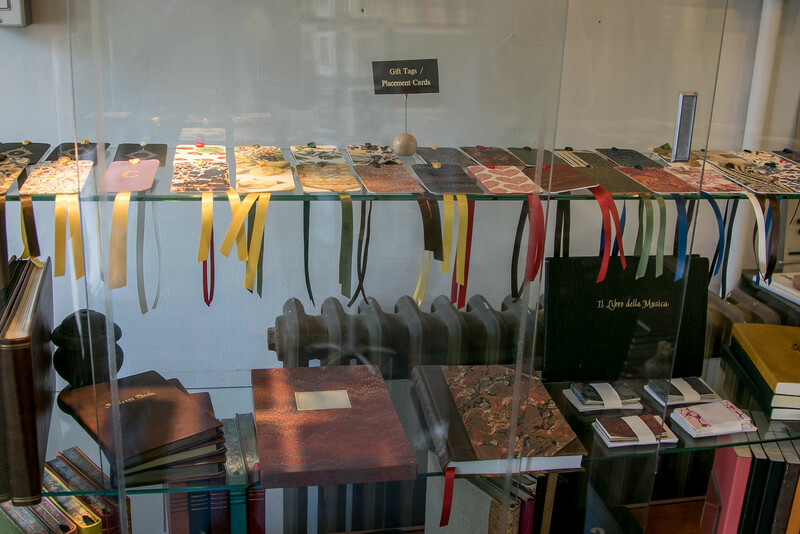 He worked for Weber Bookbindery in Frankfurt / Main until September 1978, whenhe enrolled in the master course in book binding at the Academy of Applied Arts in Munich, Bavaria. 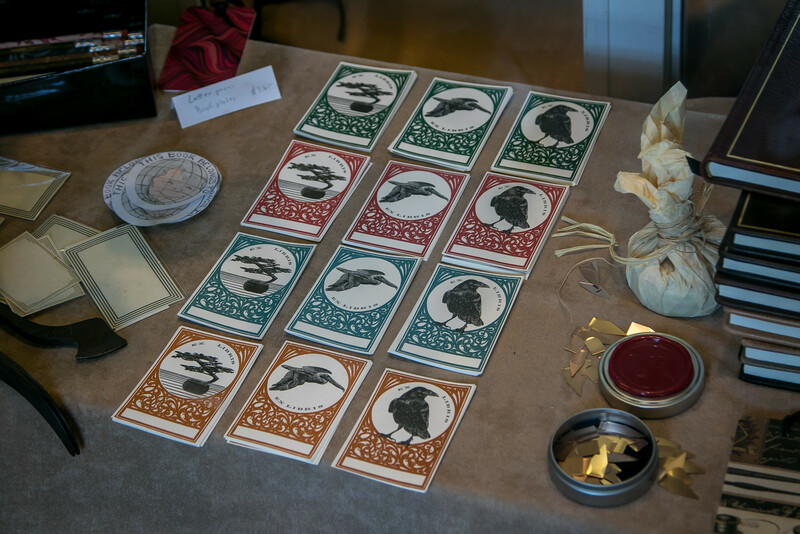 He graduated with two master degrees in bookbinding. 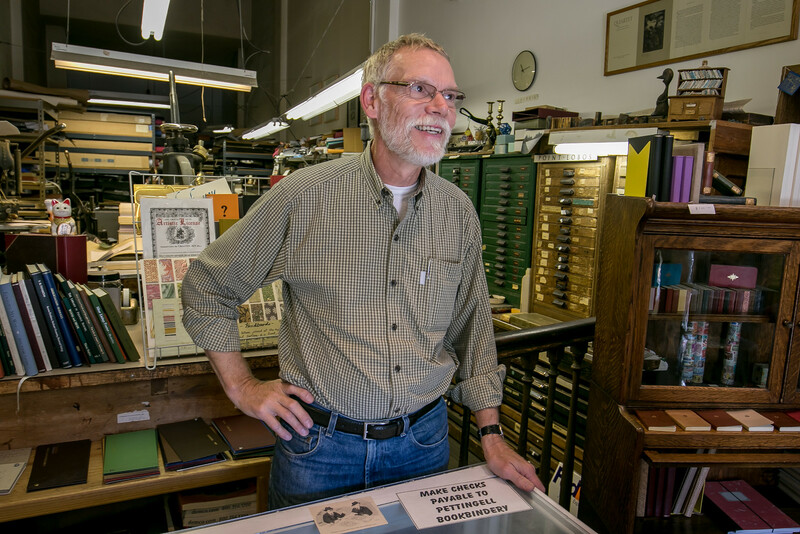 In 1980 he moved to San Francisco and worked at Schuberth’s Bookbindery. 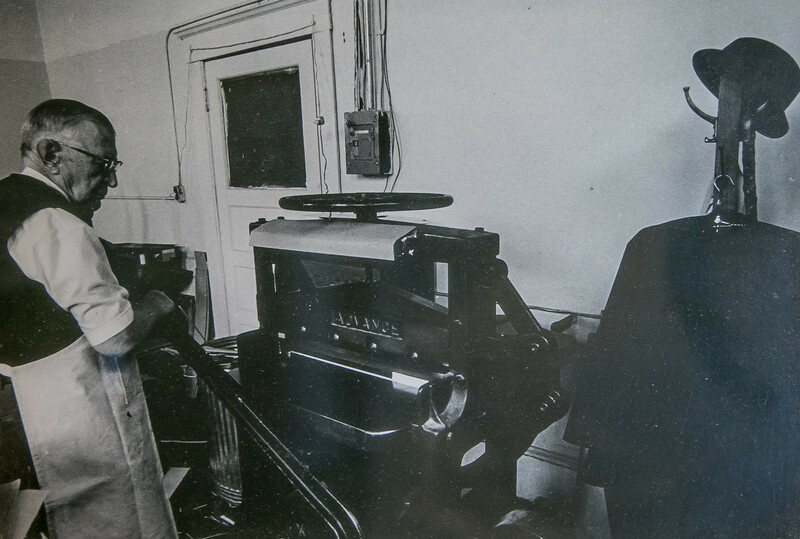 In 1986, he opened his own business in San Francisco. 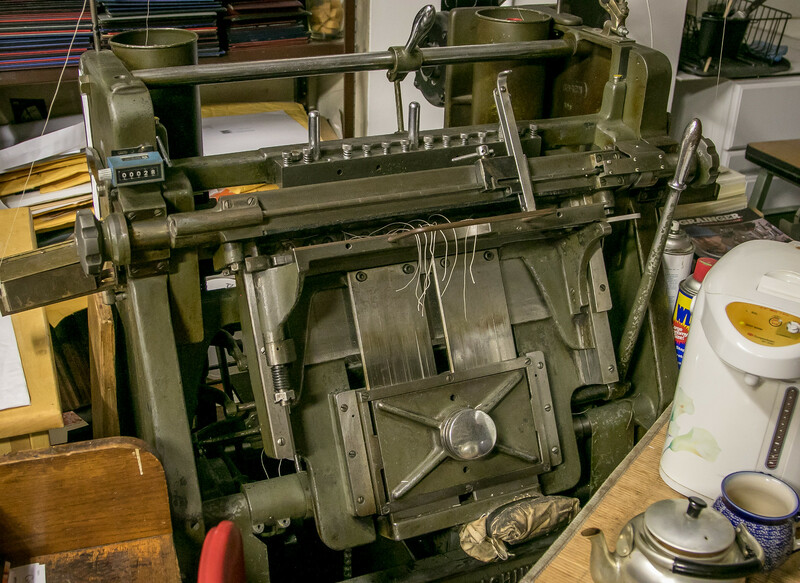 The business was consolidated with Pettingell Book Bindery in 1994. After 23 years in the Bancroft Avenue shop, things are little too cluttered for Rötzscher’s Germanic temperament. For me – just right. He works alone most days. Bella joins him some days. She’s not much help with keeping it neat. 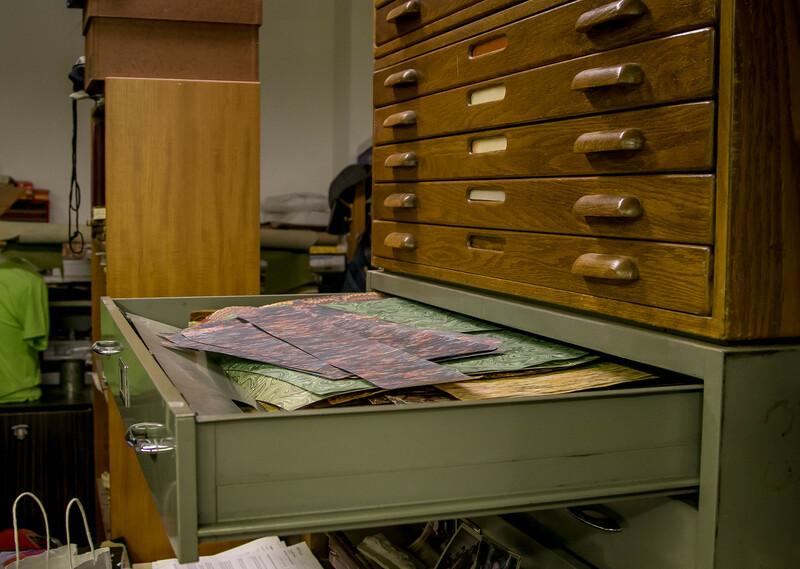 Historically, there was a steady stream of dissertations to be bound. 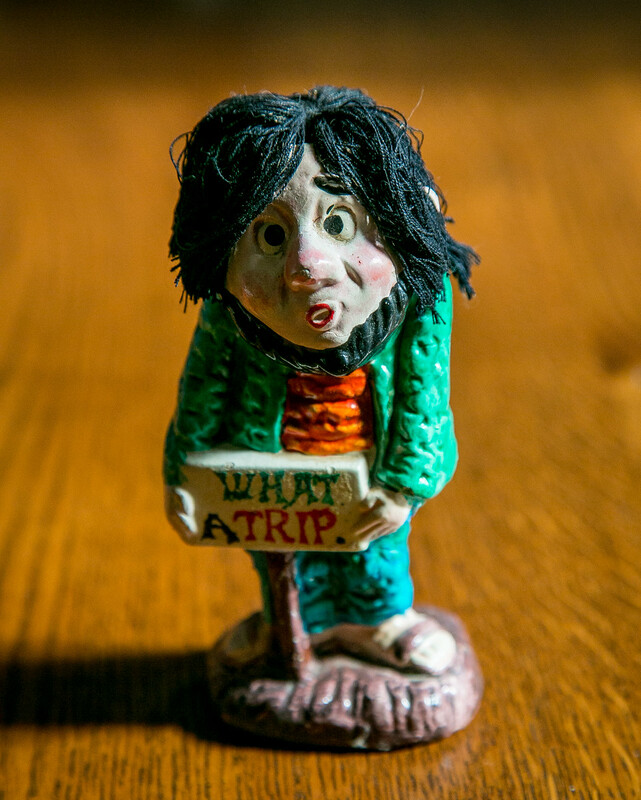 Now, not so much – digital is king. 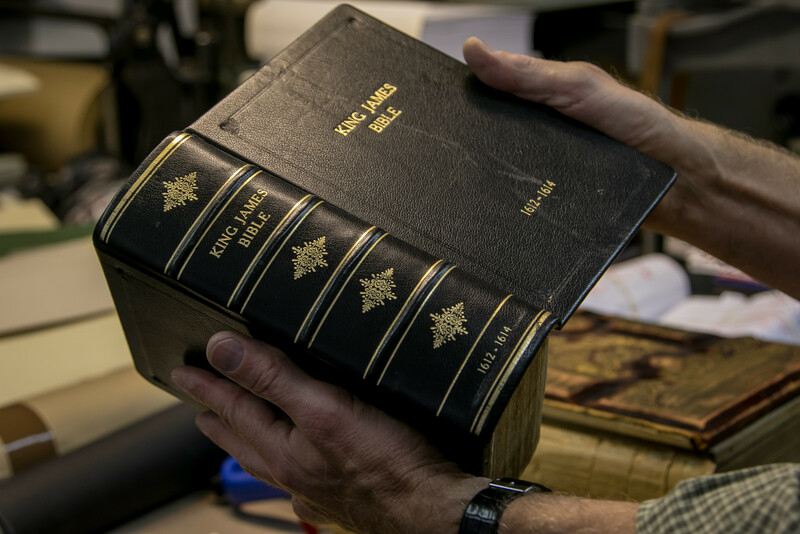 Restoration of old books is a big part of the business. Family Bibles are a big deal. Nice job on this one, no? You can see one in progress behind Noah’s Ark. 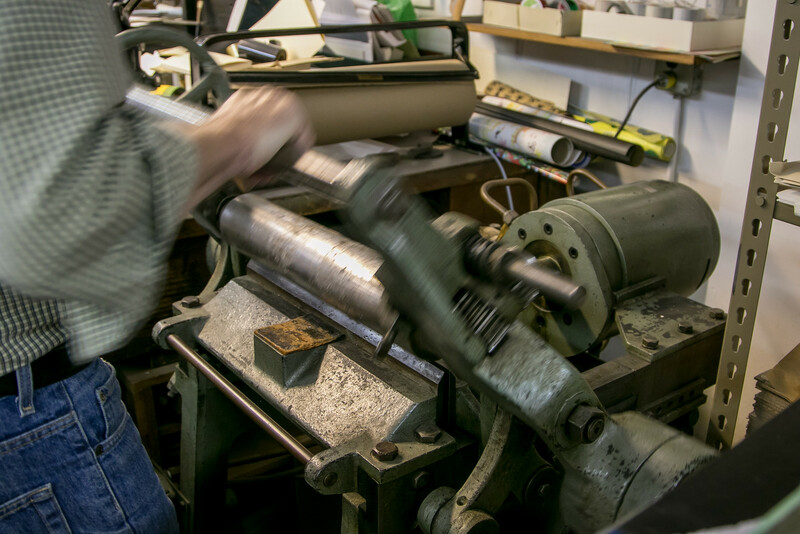 Specialized tools and machines, almost all of which are manually run, fill the shop. 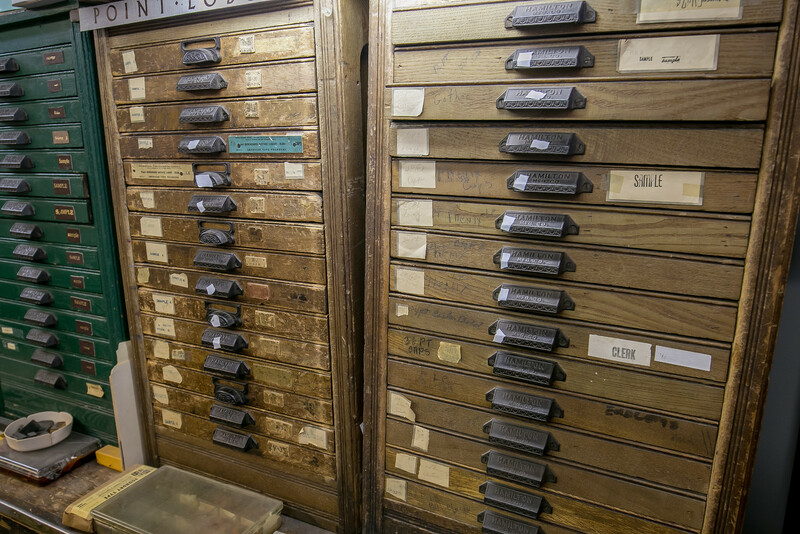 These are rollers, used for making an indentation in a leather binding. In the King James Bible shown above, you can see a rolled indented rectangle on the front cover. 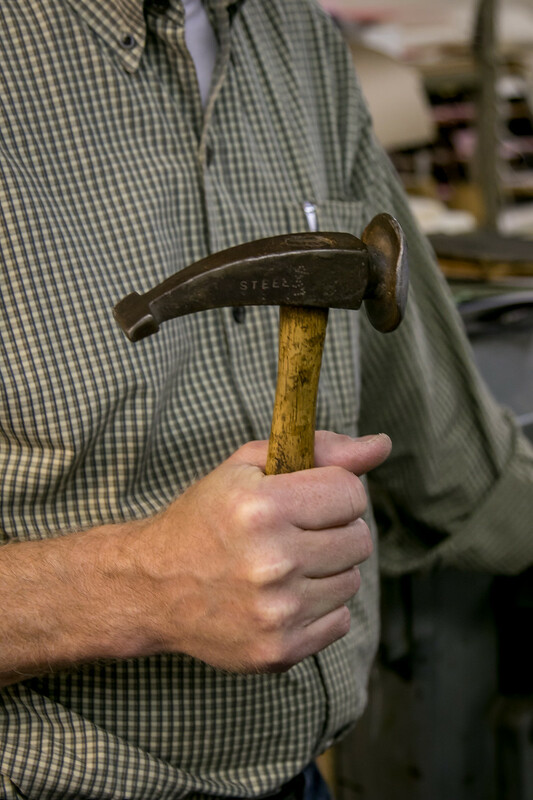 A bookbinder’s hammer is used to round the spine of a text block. These hammers are unique in that they have a dome shaped head and a claw end without a notch, rounded smooth. Paper stitcher machines use a spool of wire to bind sheets of paper together with a stitch. 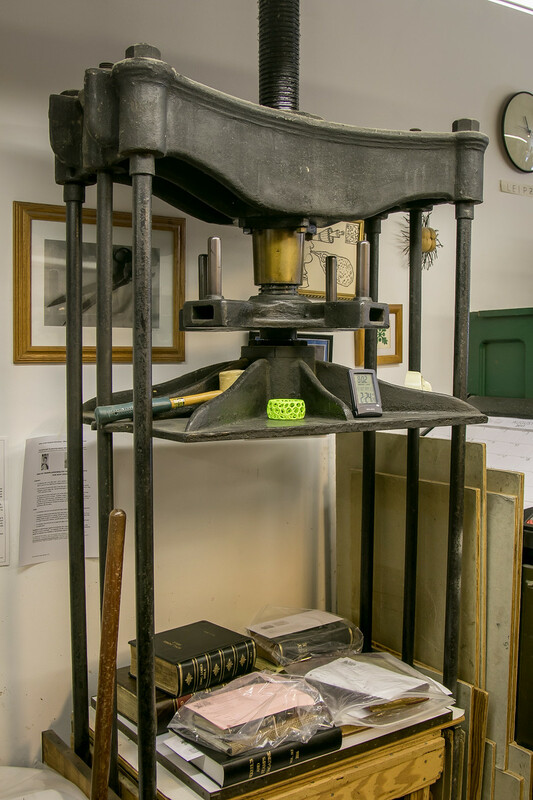 This is a rounding press. The word “rounding” applies to the back of the book, and is preliminary to backing. Action shot! 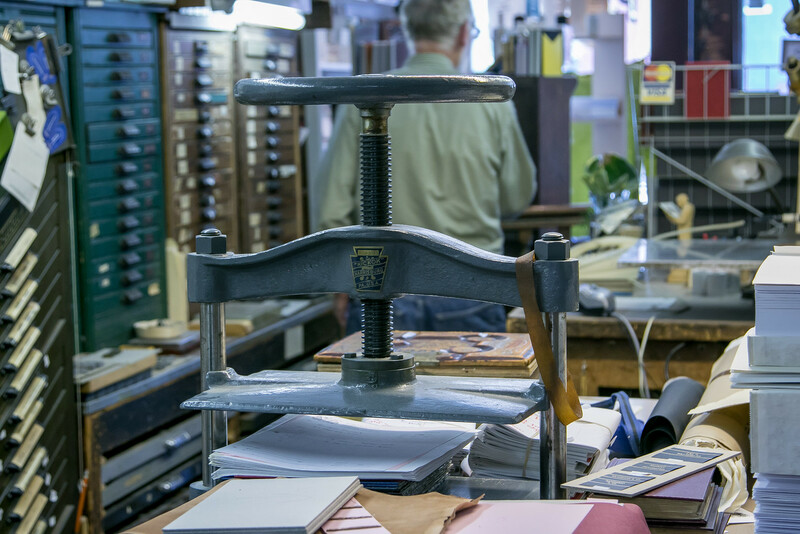 There are a number of hand-operated book binding presses in the shop. Above are two. 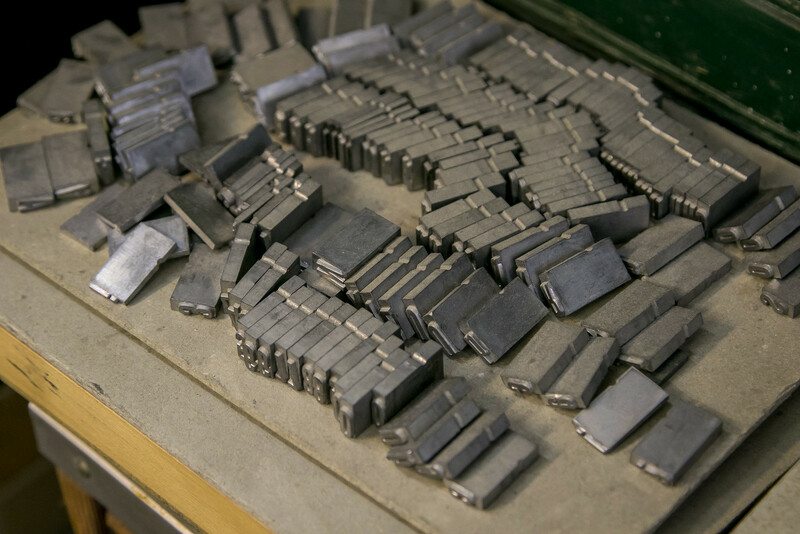 Then there is the type, set for the words on the binding. 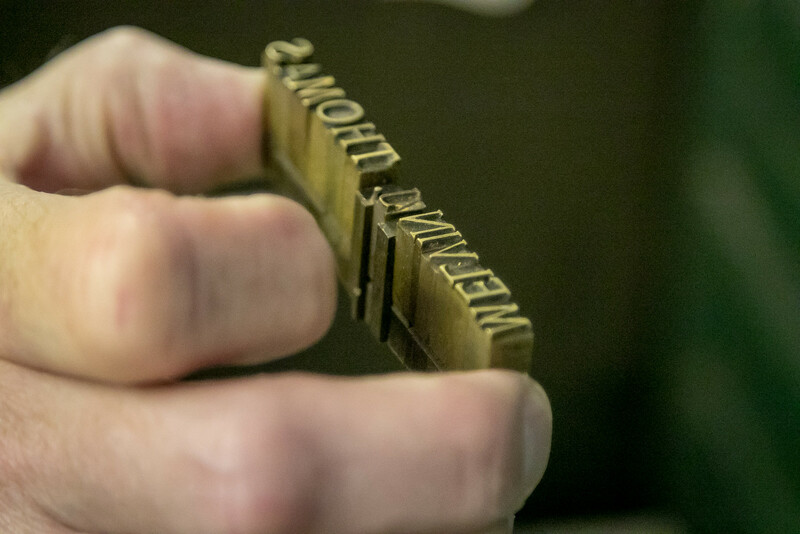 This hand press pushes the heated typeset into the cover or spine of a book. 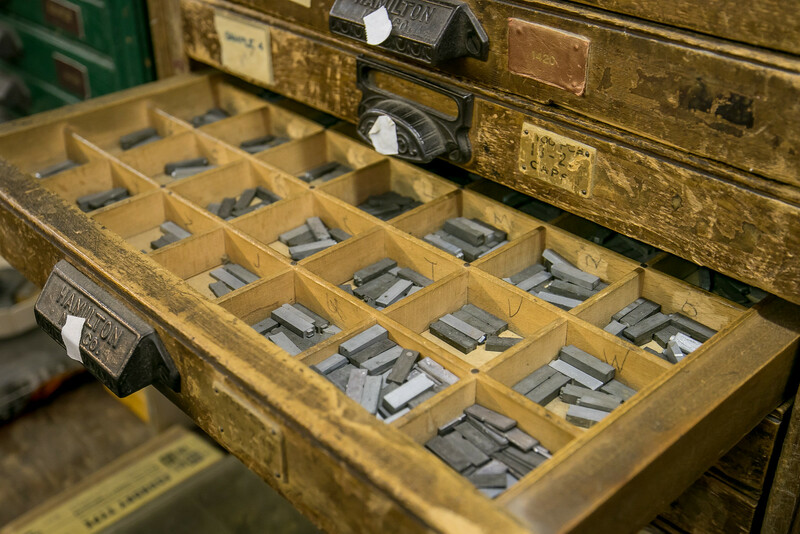 Typesetters had a standard layout for storing type. Book binders use a simpler A through Z format. 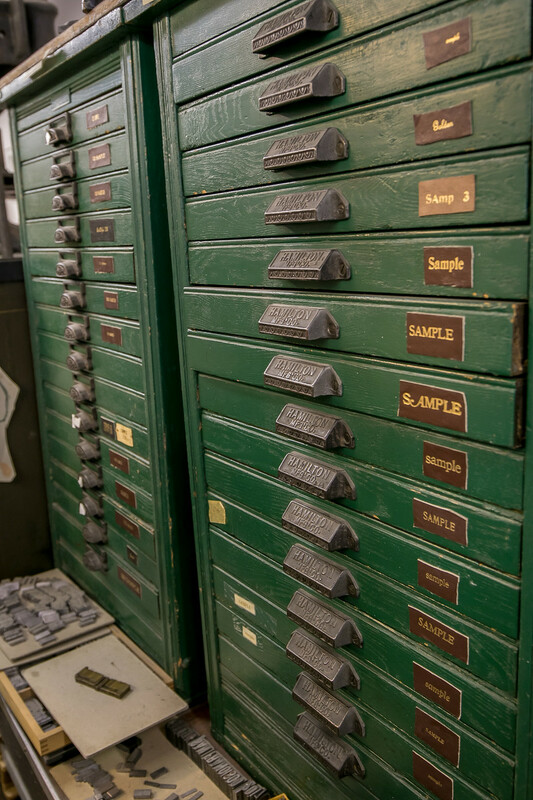 And – there are drawers for the decorative paper used in the binding process. Rötzscher is not big on being idle. 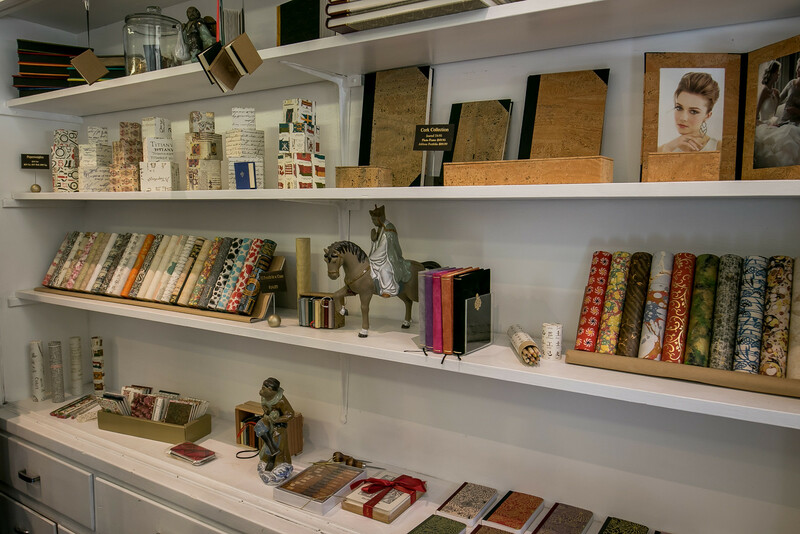 If he doesn’t have a job that he can work on at the moment, he fashions gifts – journals and bookmarks and bookplates and more. I have known Rötzscher for at least 20 years. He has rebound a number of books in my slang library. Most have been cloth bound, but despite my vegetarian diet and principles I have had several bound in leather. 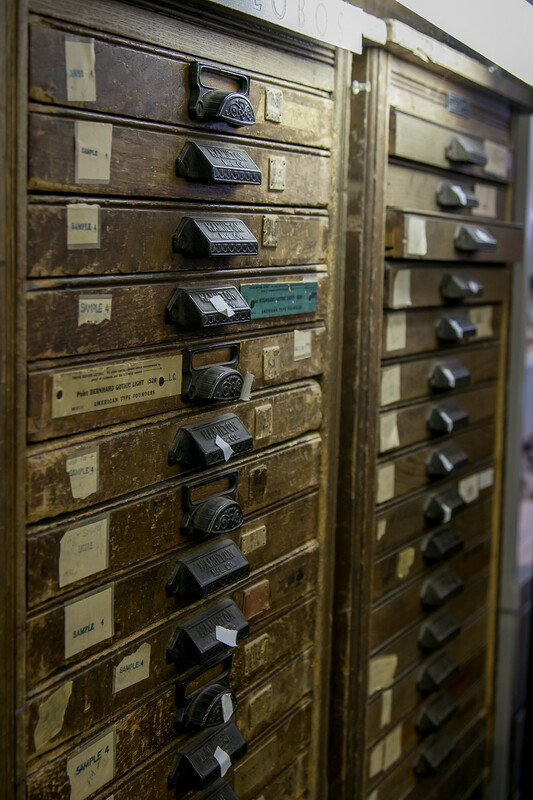 It is a rich smell that evokes for me the smell of my grandfather’s library in my grandmother’s house. Rötzscher is a dying breed. He is a consummate professional, a meticulous perfectionist. He knows that as the value that society places on printed books diminishes, his craft declines. He will ride it out. After him, not without hope, but unknown. 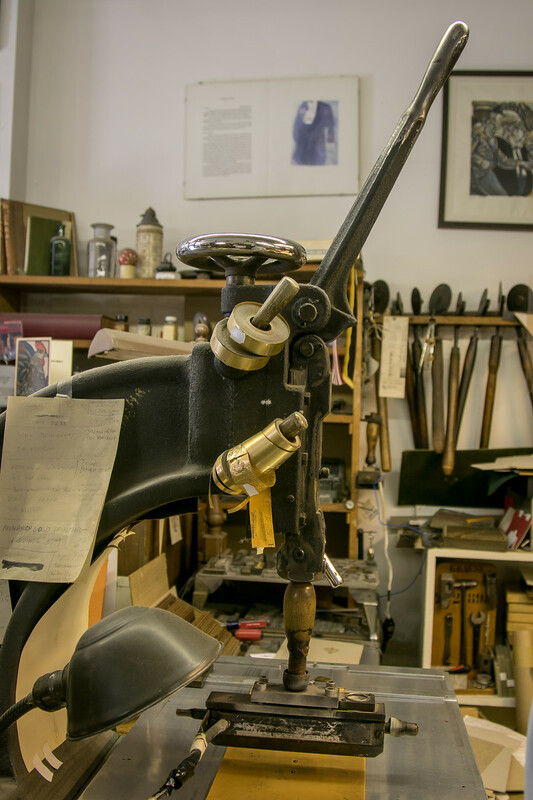 For the years that he remains, his shop and his craft and his gifts are all treasures, cool tools and machines and materials and beautiful end-results. Berkeley is better for having had Pettingill’s for the last 91 years. 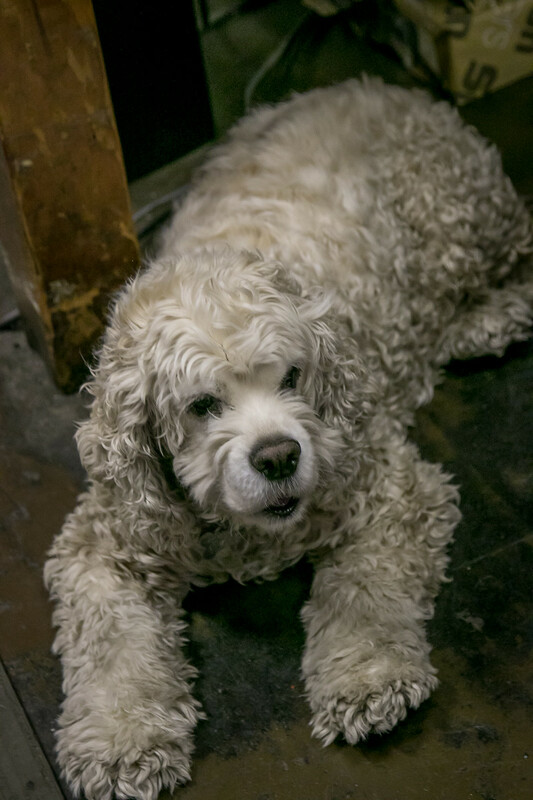 I asked him about something he said to Berkeleyside in 2015 – “When you start something you have no idea where you’ll end up. That’s the beauty of life.” He just shrugged his shoulders and smiled. Well, yes, follow your dreams down. I handed my friend the draft post. As I suspicioned, he was drawn to the drawers. “Wow.” That was about all he could say. I could see his mind racing. The drawers don’t exactly go with his Danish Modern theme, and I don’t know what he would put in them, but I can see that faraway look in his eyes. That Berkeley treasure was unknown to me, thanks for the enlightenment ! Nice . I would have never known. Thanks for this. 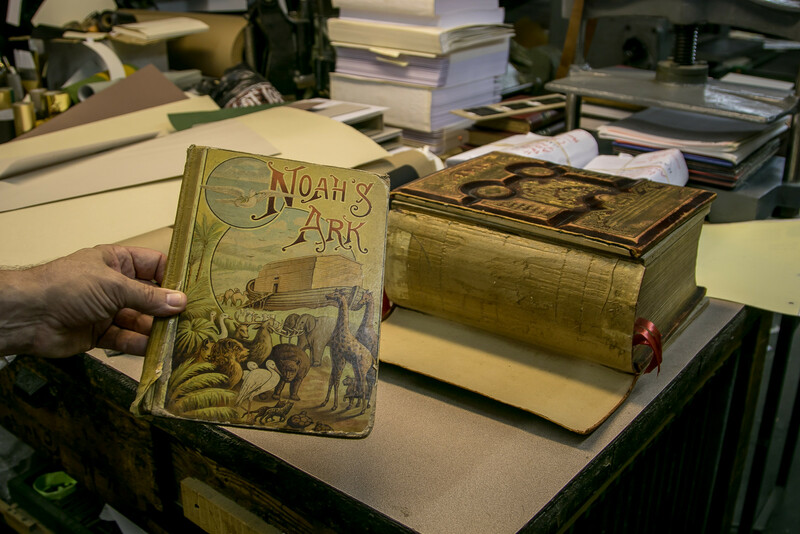 Before reading, I never knew what craftsmanship went into bookbinding.